This might be my first meat/beef/steak recipe, but it won’t be my last. Even though I don’t eat it very often at all there are a few ways I will eat it. This is one of the ways. Ropa Vieja is a Spanish (Cuban specific) way to cook flank steak, shredded in a sauce. It is normally served over rice. You can also serve plantains or beans with it! Just a little fact that I heard about once, when I went to a Cuban restaurant in our area….Ropa Vieja means “Old Clothes”. Who knew?? 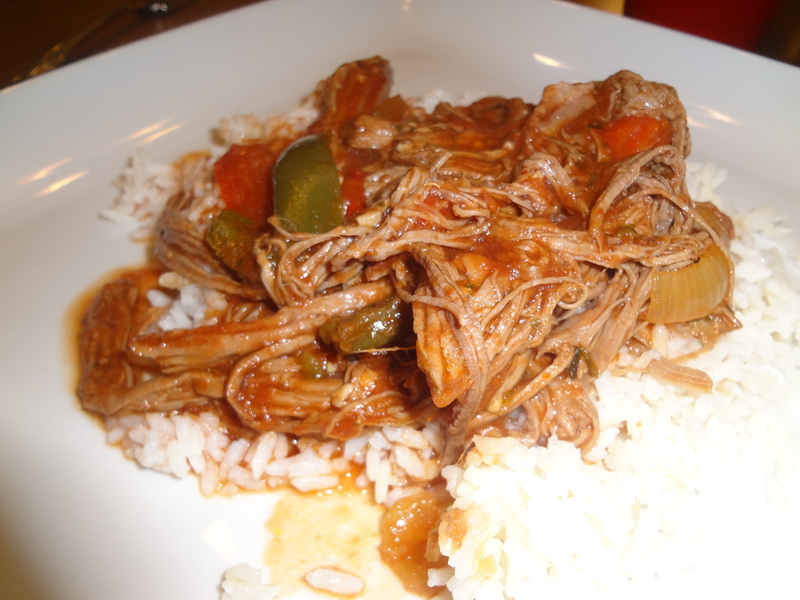 I have a few recipes for Ropa Vieja (that I will eventually add)….and I like the others better, but this one is still good! The others have more spice to them…this one doesn’t. Give it a try and let me know what you think! I love cooking (and eating) ethnic foods. I just think it’s like a new little adventure when you cook with new spices, new ways, with new ingredients. So if you have any great, different foods you think I should try…let me know!!! In frying pan, heat vegetable oil and cook steak about 4 minutes on each side. Place steak in crock pot. Add all other ingredients. Mix well. Cook on LOW 7-8 hours or HIGH 4 hours. Welcome to the world of NECCO! News, crafts, recipes and more from the New England Confectionery Company (NECCO). Simple tasty convienient food done on a budget please leave any comments on the recipie you have tried or any changes or ideas you have so I can try them and add a post with the changes. All things BBQ, bacon, dude food & beer.